On the Art of Hosting list today there has been a very interesting conversation about some of the Japanese words that are used to describe space and container. As I will be working this spring in Japan with these very concepts, I thought it would be interesting to hear from my colleagues Yurie Makihara and Kazuhiko Nakamura about these ideas of “wa,” “ma,” “ba,” and “tokoro.” Yurie shared her thoughts, on some of these words, including noting that the word “ba” is often cited by foreigners as an example of a word describing the quality of dialogic container that exists in Japanese and not English. I learned today that all of these words are similar, and include not just ideas about the quality of space but time as well. Anyone who engages in dialogue will know that there is a time and a place for everything. Over my career I’ve had the gift of working extensively in indigenous communities in North America and one of the features of many (but not all) indigenous languages is the fact that they are verb-based as opposed to English which is very noun-based. Indigenous languages here contain many words and ideas that are similar to the ones Yurie described, and I have experienced language speaking Elders and others cautioning me that “this time isn’t right” or “the space is wrong” in a way that is hard to put into English. When they say those things, the English ear hears the word “time” or “space” (the nouns in the sentence), but the words the Elders use are pointing to the qualities of the relationships between things in the container of time or space. In English we lack relational language. We have to use metaphors like “safe space” or “brave space” or “juicy” or “a ripe time” that point a bit at the feel, but use words as metaphors and not direct. Over the years, teaching about containers to people who speak these languages I have begun to learn a few concepts. In Diné there is a word – “k’e” – which describes the quality of connection between an individual and their clan and family that is critical for survival and sustainability. 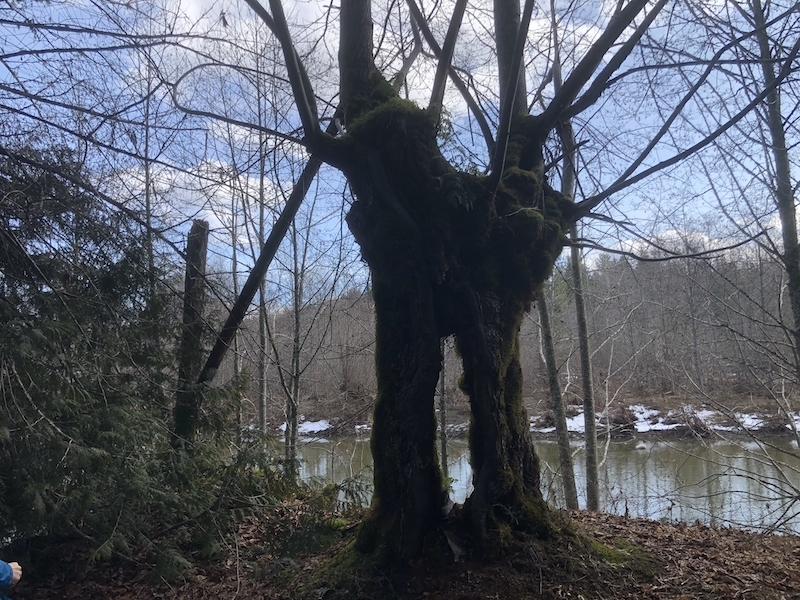 In Nuu-Chah-Nulth, the word “tsawalk” meaning “oneness” really is a word that points to the presence of a texture in a container that helps us see the connection between things (people, animals, land…) and the relationship between the spiritual and physical world. Without tsawalk we are not doing good work, because we are not doing work that attends to the many relational fields that are necessary to create space that is fully alive. More of my reflections here. Ove the years I’ve learned of similar words and ideas in other languages an cultures: in fact this seems to be a feature of human language in a way that isn’t quite available to unilingual English speakers like myself. Its the reason we find these other languages and concepts attractive. They fill a need we have. In some ways it’s too bad that we use English in the Art of Hosting community as our global language! The most important thing for us as a community – the quality of a container – is the one thing that is difficult to explain properly in English. The word itself is actually a metaphor and used in indigenous-settler contexts, as my friend Jerry Nagel pointed out in an email this morning, it can be taken to mean the very core act of colonization: to contain a group of people. So be careful! Perhaps this is why for the most part, people I work with in English are interested in tools and processes, and why we have a hard time explaining the “art” of the Art of Hosting. It’s easier to talk about the nouns we use because we have language for them. It’s hard to talk about what happens when we approach space and container as artists, with an eye to hosting the quality of relationships and interactions that create generative action. In English there is no satisfying way to talk about this, at least not that I’ve found. We have to default to poetry, which isn’t necessarily a bad thing. African American have greatly adapted the English language to include such concepts. Expressions like: “The vibe ain’t right” and “The time ain’t right” and “chill” which often speak to the need for connection, the right timing, and the need to build relationship. “feel me?” is also an expression used to indicate the need for a certain level of empathy before going to the next level of depth. I often find myself using these familiar African American expressions to describe what otherwise would be “energy” or perceived as woo-hoo language. The perception of African American “realness” also helps, too. Love to talk more about this! In my art practice – music – there is lots of language to describe this. And yes much of it has origin in African American musical practice. “Groove” is one I deeply identify with as a way of describing the nature of inter-subjective space and of course is also intimately related to time. In fact it’s almost fair to stay it is an emergent quality of collective feeling that springs up from the way an ensemble uses time. I appreciate your writing here about the limitation of language, specifically the English language, when harnessing the creative power of a group. Even to use the word ‘harness’ implies a kind of tethering or leading and I suppose the context in which a word is used is half of its meaning. I agree that ‘container’ is a word that could imply a capturing or holding in, the colonial nature of the English language is undeniable. Sort of like the term ‘shot’ or ‘capture’ is used in photography. I have to admit that I’ve never really liked the term, container, very much. (Contain-Her). The english language tends to be more masculine and has evolved over time to function as a kind of engine for business transactions, it seems. When I was in school, studying art, I did some research into the concepts of space and place. Henri Lefebvre was one of the philosophers who I read at that time and he proposed that space was a social contruction. His book, The Production of Space (1974), is an amazing analysis of social space. So we live in these both visible and invisible spaces that are being reproduced over and over by ideology, social conditioning, history, etc. There are certain visible elements to those spaces, like the way people interact with each other, speak or frame situations, but underneath there are all of the hidden or unseen, and perhaps denied elements. There are also sacred spaces, when we acknowledge our deeper connection to the land and the ancestors of place. I see you doing this when you work, invoking reverence and remembrance, telling stories of the sacred land and people. Perhaps artistic approaches to space have the ability to gently open these invisible powers. Like your poem at the opening circle of the Art of Hosting, which created an effect within the group field or space. A kind of effect that connected us all together, brought us into a creative space, gave us permission to express our creativity. A poem that invited a spirit of play and beauty into the space. Deep appreciation for this comment Jill. I had thought of adding some stuff on place and space from a Welsh and Irish perspective as I have worked with folks in these languages as well who have confronted colonization and enclosure. My friend Anthony McCann in particular has some beautiful stuff on this. Perhaps I’ll put together a follow up blog post. Space and Place are both very complex and controversial subjects. I think inviting your audience to look more deeply into them is exciting. I would be curious to hear more about the different cultural experiences of ‘enclosure’. There are so many layers to these terms that seem to be masked by the everyday. Considering we live in a time when all of the social constructs are up for review and revision, I think it would be a timely conversation. It would also be an exciting project to invite Art of Hosting Practitioners from different cultures to inject new terms into the practice. Very thoughtful conversation about language and how it both reflects society and shapes society, at all levels. Thank you all. It’s not something we think and talk about on a day-to-day basis, but should be something we stop to think about regularly, especially when bringing a group of diverse people together. I’ll be sharing this with my team. I love this so much. Just read the Wayfinders by Wade Davis who describes the inmense human diversity that is only seen through languagues. And how many of the human voices in these languagues are silencing and with them the culture. It is so hard to understand so it’s wonderful to read blogs that help understand it better and better and create awareness and sensing. I also find Nora Bateson helpful in exploring contextual, relational space, she tries to give it words in English. Thanks Chris for inspiring and educating us. And then there is Wisdom Sits in Places: Landscape and Language among the Western Apache, by Keith Basso. Well worth a read. This conversation also echoes Benjamin Whorf’s classic (and controversial)1939 article, “The relation of habitual thought and behavior to language,” which discusses concepts of time in Hopi. I haven’t read the article in years, but I remember he used the term “eventing” as a way of indicating the cyclical worldview that was, according to Whorf, grammatically encoded within Hopi, as opposed to the noun-based worldview supposedly encoded in English and other “Standard Average European” languages. I think I remember Whorf’s theories being discredited but I’ll need some research to refresh my memory. At any rate, these sources point to a different way of thinking about container for sure. Thanks for commenting! Yes, there have been well-supported challenges to Whorf’s analysis of Hope for sure, but his general point that the particular language(s) you speak can shape (but not determine) the way you think is supported by most linguistic anthropologists, and there is increasing evidence from cognitive scientists as well. (Check out Lera Boroditsky’s work or TED Talk.) The mischaracterized and misnamed “Sapir-Whorf Hypothesis” (that language DETERMINES thought), which linguists and psychologists still love to hate, was never advocated by Whorf, Sapir, or any other anthropologist. Instead, they analyzed how language, thought, and culture all influence one another. That’s it! It’s all coming back to me now. Verb interesting comments.